Last night, Times Square boomed with an exciting, surprise concert for World AIDS Day featuring U2. Bono, who was set to perform with his band, couldn't make the show due to an upsetting injury, but leave it to Bruce Springsteen and Coldplay's Chris Martin to step in for a truly incredible performance (subsequently nicknamed "U2 Minus One"). The concert also featured a performance by Kanye (yes Yeezus in Times Square!) as well as Carrie Underwood. The concert helped raise awareness for (RED) and the fight against AIDS, as well as raising money for the cause. 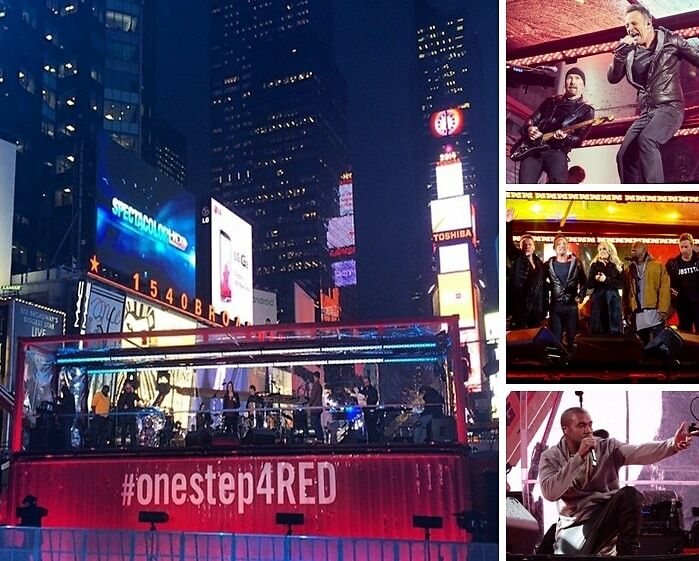 If you missed the powerful #onestep4RED evening, be sure to check out our slideshow for all the best Instagrams from right there in Times Square.